Objectives: Anti-tumor necrosis factor (TNF) antibodies have shown efficacy in the prevention of recurrence of Crohn&apos;s disease after intestinal resection. However, some patients develop surgical recurrence despite this therapy. We aimed to evaluate the risk factors for recurrence of Crohn&apos;s disease requiring surgery while receiving post-operative anti-TNF therapy. Methods: We performed a retrospective evaluation of 164 patients who had received post-operative anti-TNF maintenance therapy between 2002 and 2016. We classified Crohn&apos;s disease-related re-operation as surgical recurrence and analyzed its risk factors using the Cox proportional hazard model. Results: Of the 164 participants, 128 had received infliximab and 36 had received adalimumab maintenance therapy. We obtained follow-up data over a mean of 60.2 months. 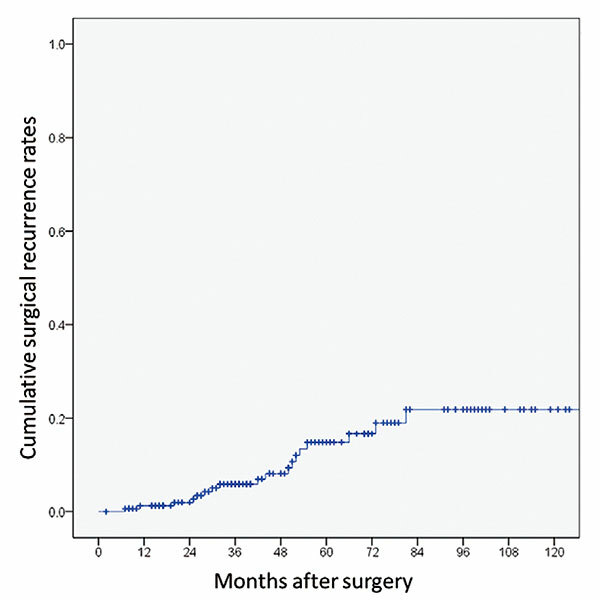 The proportion of patients with surgical recurrence at 5 years was 14.9%. The only independent risk factor for surgical recurrence, which we identified was post-operative smoking habit (odds ratio, 5.03; 95% CI, 1.14-12.8; P=0.033). Conclusions: Post-operative smoking may be a significant risk factor for post-operative surgical recurrence of Crohn&apos;s disease while receiving anti-TNF maintenance therapy.